If you’ve been reading my posts regularly, you know that I have funny, interesting kids (at least in my opinion). They can and do say some funny stuff. I really need to keep a journal with me at all times so I can jot stuff down as we go through our day (I’ll put that on my To Do list). I’ve NEVER heard someone say that they wanted 5th place, have you? Who says that? Well, my son apparently. I’m thinking, “Really? What are the odds? How weird is that?” The 5th place ribbon is the green one in the picture. 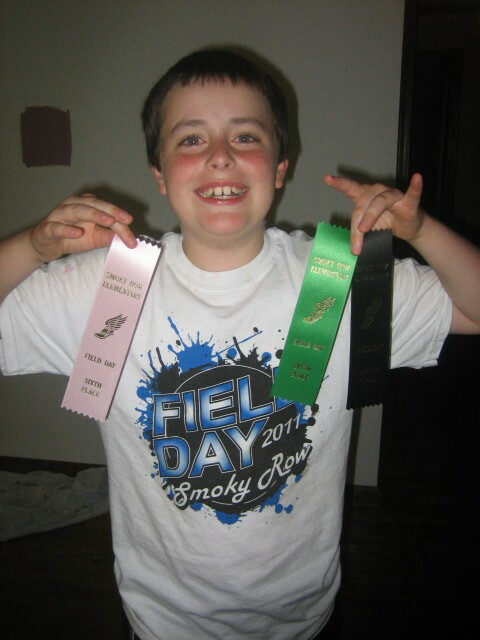 As a side note, I want to clarify something for all of you, from the dinner discussion last night, both Rachel and I were under the impression that he needed the 5th grade ribbon to complete the entire ribbon set (honorable mention through 6th place). After further discussions with Jack on the subject today, I discovered that he is still missing the following ribbons: 1st, 3rd and 4th. So, why was he shooting for the missing 5th place, when he still needed a 1st, 3rd and 4th place ribbon for his set? What’s wrong with 1st place? As an extremely competitive person, I’m a little perplexed by his goal-setting this week. What’s going on in that 11-year-old brain of his? Hell if I know. I’m going to have to defer to his father on this one since the boy is an exact replica (down to the last molecule). Mike will be able to explain Jack’s line of thinking to me – I’m sure there is a good explanation, an ultimate plan. This entry was posted in Everyday Life, Parenthood and tagged 5th grade, goal setting, goals, grade school, postaweek2011, reaching goals, track and field day. Bookmark the permalink. Thanks! He’s pretty cool – he makes me laugh at least once a day. The stuff that comes out of that kid’s mouth is priceless!